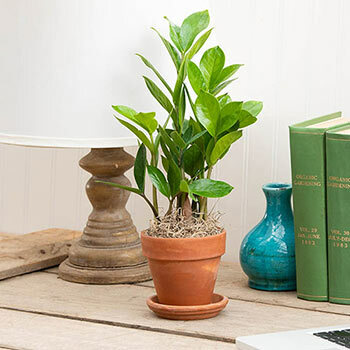 Looking for a plant that will hold up no matter where you put it? Say hello to the ZZ Plant (aka Zamioculcas zamiifolia or Zanzibar Gem). It's an easy, low-maintenance tropical houseplant with shiny, dark green leaves on stalks that grow anywhere between 3-5' tall. It's perfect for apartments and other indoor spaces, especially since it helps purify the air! The ZZ Plant can handle being ignored for weeks at a time. Water it once every three weeks in the warmer seasons, and just once a month when it's cold. Just be sure to rinse your hands after handling the leaves, and keep out of reach of curious pets, since the ZZ Plant may irritate some. 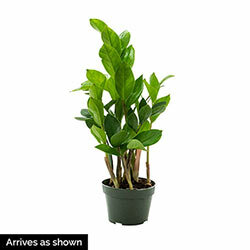 With a lush, tropical look and an indistructibly easy-care nature, this is the perfect gift for someone without the time or capability to care for needy plants. Just set it on a shelf and let it work its heartwarming magic! Bloom Time Blooms are very rare and are not very impressive. It will flower in any level of light in mid/late summer and early fall. Foliage Type: Multiple long stalks of shiny green leaves that grow out of bulbous rhizomes. Bloom Time: Blooms are very rare and are not very impressive. It will flower in any level of light in mid/late summer and early fall. Flower Form: The flower is shaped like a peace lily; it has one petal that encompasses the flower with one stalk in the center. Planting Instructions: Plant the ZZ plant in a new pot at the same soil level when the roots fill out the old pot. Soil Requirements: Thanks to the ZZ plant's rhizomes which store water, it can stand dry soil for a long time. Do not oversaturate the plant with water. Pruning: Prune away any yellowing or dead leaves and stems as they appear. The flower can be pruned away with no harm to the plant. If the plant needs to be cut all the way back, it will regrow over time. Winter Care: Water the ZZ plant less frequently during the winter months. Additional Information: Mildly toxic to pets and humans. Wash hands after handling the leaves to prevent potential irritation.